The final balance of the CIK-FIA European Championship is simply flattering for Vortex engines. The final balance of the CIK-FIA European Championship is simply flattering for Vortex engines. 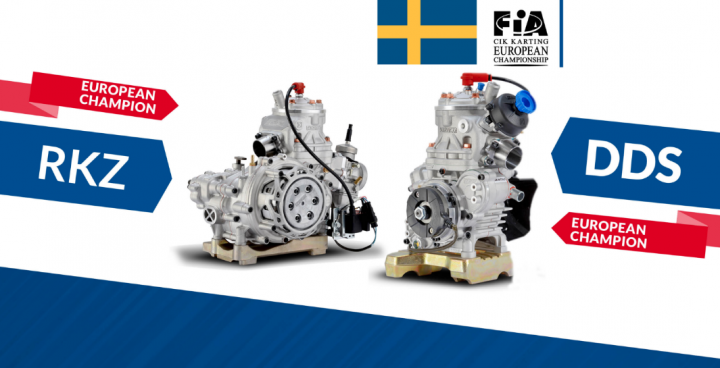 In the final race, held in Sweden, Vortex engines have graduated European Champions in KZ2 and OK categories. On the occasion of the Kristianstad appointment, Vortex engines led three finals out of four, in OKJ, OK, and KZ category. In KZ2, the victory of the European title won by RVZ engine with the German Leon Köhler (KSM Schumacher Racing Team) is clear. Köhler won the title climbing twice on the podium, on a total of three races, and signing a pole position. RKZ was also a brilliant winner, always in KZ2 class, in Genk (Belgium) with Matteo Viganò (Tony Kart Racing Team). Nevertheless, the RKZ has shown levels of absolute excellence even in KZ class, category in which it won a victory (out of three events) with Hajek, a second place, a pole position and two best lap in the final. At the end of the Championship, Patrick Hajek (Kosmic Kart Racing Department) ranked second overall. In the final round of the European Championships, the DDS engines on the starting grid were not less than 49%. Such a strong presence in the European Championship has been supported by top performance in all five races of the European Championships. The DDS achieved excellent results by winning four times (Pourchaire, Hiltbrand, Taoufik and Kenneally), winning seven podiums (four 2nd and three 3rd) and gaining 30 qualifying heats (equivalent to 75% of race heats). The success of the European title by DDS, with Sami Taoufik (Ricky Flynn Motorsport) and with the second place of Pavel Bulantsev (Ward Racing) are the crown of a never-ending supremacy. In the top 10 of the European Championship there are 8 drivers running with Vortex engines (like 80%). Significant figures are also present in the cadet class, with 44.4% of DDJ engines in the entry list of the last round in Kristianstad. The pole positions obtained during the championship by the DDJs, were two (Doohan and Rosso), four podiums (two 2nd and two 3rd positions) and all was crowned by the success in the final race, gained by Doohan (Ricky Flynn Motorsport). The final standing sees two DDJs (Thompson and Doohan) on the European podium, second and third place.